High Intensity Pre-Workout Formula! 3 G Citrulline, 2.4G Beta-Alanine, 1G Nitrosigine, 100MG Infinergy & 50MG TeaCrine! The next generation of R1 Pre Train has arrived – and it’s more powerful than ever. Get pumped for Nitrosigine, Citrulline, and Agmatine, Jacked by Infinergy, Theobromine, and TeaCrine, and keep the party going longer with CarnoSyn and Betaine. You’ll be hard pressed to find more stacked pre-workout than this. With full panel transparency it’s easy to compare for yourself. When are the best times to use R1 Pre Train? Directions: Mix one (1) scoop with 8-10 oz. of cold water 20-30 minutes prior to training. DO NOT exceed one (1) serving in a 24 hour period. How does R1 Pre Train differ from R1 Train? Can I combine R1 Pre Train and R1 Train? R1 Train and R1 Pre Train are designed to be stacked together. 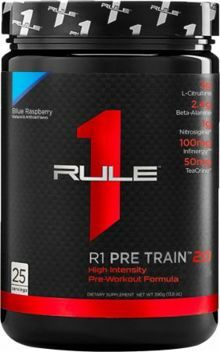 Use R1 Pre Train before workouts and follow up with R1 Train during or after you finish working out. Does R1 Pre Train contain creatine? No, but unflavored creatine powders like R1 Creatine may be easily added, if desired.